Danny Wilson said his side conceded soft goals in the second half that took the derby game against Sheffield United away from them. Chesterfield were beaten 4-1 by a side Wilson said were arguably ‘champions elect’ despite leading at the break thanks to Jon Nolan’s early volley. 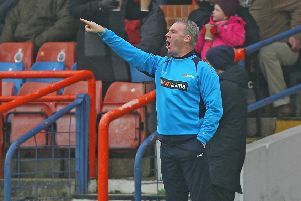 The Spireites boss was unhappy with the defending after the interval as the Blades swept the hosts away. But he did enjoy the first half display. “I thought we were very, very good in the first half, we dominated large periods and played some good football, had some opportunities. “We possibly could have gone in 2-0 which would have been terrific. Everything was going well. “Our counter attack football was excellent. “Then in the second half we concede a goal and it was a soft goal, Freeman comes in and we don’t pick him up and it’s a free header, 1-1. “Still we had chances, we had a fantastic chance to make it 2-1, great save from Simon Moore and anyone following up would have had an empty goal but we didn’t. The loss of both Ched Evans and Jon Nolan to injury took the wind out of Chesterfield’s sails completely, the second half becoming a one-sided rout. “Losing the two boys knocked our rhythm out of us,” said Wilson. “We won’t know until tomorrow but there’s a hamstring and an ankle injury and we’ll assess tomorrow how they are. The second half onslaught, albeit aided by poor defending in Wilson’s eyes, showcased how good the Blades are. But the Spireites’ first half performance against such a good team gives him reason for optimism. Former United boss Wilson said: “The third goal is a killer and you see then what a good side they are. “Their tails were up and they’ve got the quality going forward which is possibly a lot more than we have. “They’ve got quality players, a lot better players. Goals give everyone a confidence boost. We gave ourselves a boost in the first half and you wouldn’t have thought they were top and we were bottom. In the second half you can see what they’ve got, they’ve got quality, they’ve got goals in the team, they’re a big powerful side and they pass it well. “Are they that much better than us? After the two goals yes, before they were they? No. “They come out strong winners. Was it worth 4-1? It doesn’t matter really, it’s a defeat but I think there’s things we can take out of that. “You’ve got to take a lot of confidence from how we played, we’re playing arguably the champions elect in our league and we fared very, very well for large parts of that game.